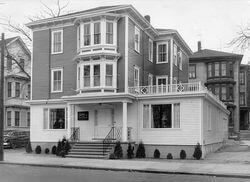 In 1944, Albert Auclair, along with his wife Alice, opened Auclair Funeral Home, at 1521 South Main St., Fall River. As the business flourished a larger facility was necessary and they moved to the present location at 690 South Main St., in 1951. In 1967, upon the death of Albert Auclair, his son Charles Auclair, assumed the operation of the business. Many upgrades to the facilities have been made through the years. Recent improvements include a portico, enlarged parking lot, automatic doors, additional bathrooms and a completely renovated, decorated and furnished interior and renovated exterior.